Ametis JSC produces Lavitol (Dihydroquercetin) from the stumps of Dahurian Larch (Gmelinii Larch) that are grown in ecologically clean areas of the Amur Region. The use of ethyl alcohol as an extracting agent allows to receive a high quality product, used in food and nutritional industries. The use of hi-tech equipments and its own patented technology for of the extraction allows to produce dihydroquercetin with 70 – 99.5% purity in industrial volumes. The monthly production volume of 99% Dihydroquercetin is 500 kg. Lavitol (Dihydroquercetin) is the active antioxidant. Ametis JSC entrusted two independent laboratories with testing the antioxidative activity of Lavitol (Dihydroquercetin). The method of the Oxygen Radical Absorption Capacity of the dissolved in water product (ORAChydro) was used in the testing. 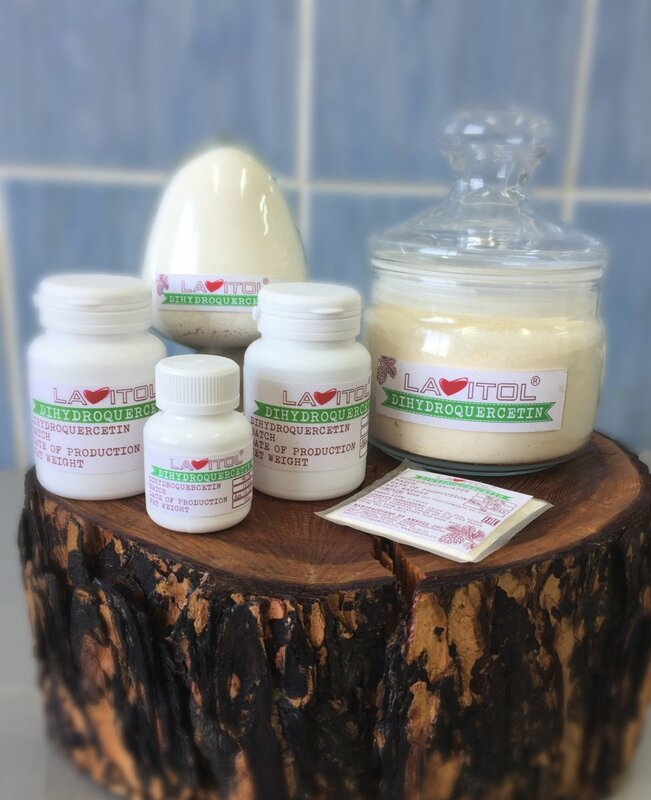 The test results showed that Lavitol (Dihydroquercetin) has very high ORAC value, which exceeds that of some known antioxidants. Dihydroquercetin acting as a substance with high level of biological activity, has positive effects on the metabolic reactions and the dynamics of various pathological processes and can be widely used in various industries. By the end of December 2013, over 300 products with dihydroquercetin were registered with the regulatory organs of the Russian Federation. Among these products, more than 200 were bioactive food supplements, over 40 food products, and approximately 80 cosmetic products. The Methodical recommendations of the State Sanitary and Epidemiological Regulation No 2.3.1.1915-04 “Recommended norm of consumption of food and biologically active supplements” has determined the appropriate and the highest allowable level of Dihydroquercetin consumption: 25–100 mg per day. The Technical Regulations of the customs Union 029/2012 allows using Dihydroquercetin as an antioxidant for manufacturing cream, dry milk, processed cheese, chocolate. The content of Dihydroquercetin in these products is 200 mg/kg fat of the product.